How many times have you come home from work, looked in your refrigerator to figure out what to cook for dinner and said “I guess we’ll be ordering in”? However, I have learned that it’s still possible to cook a home-made meal. The secret is a well-stocked pantry. By stocking your kitchen with certain staples, you will always have the ability to cook up delicious meals. Furthermore, when you do choose to stop at the store, you’ll be able to quickly pick up just one or two ingredients (i.e. a protein such as beef, chicken or fish and/or a fresh vegetable) and make a full dinner because your pantry will already have all the other ingredients you’ll need to pull off any number of recipes. 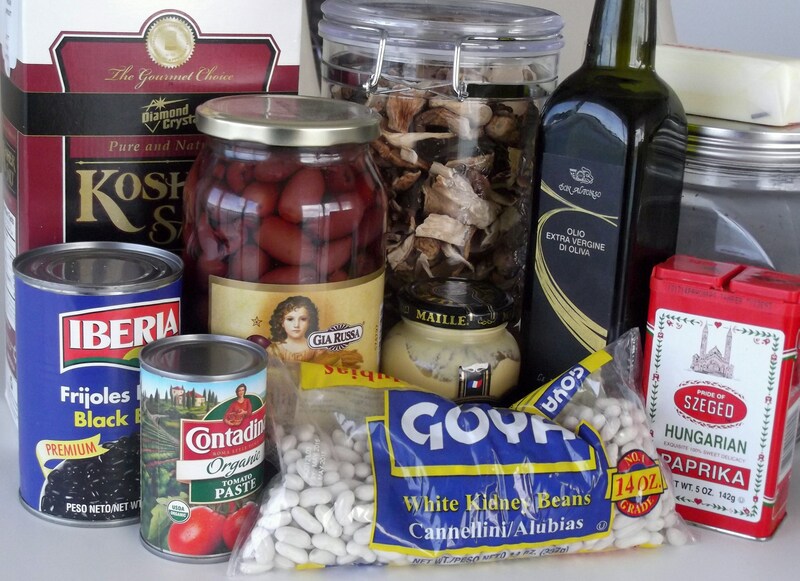 Below is a list of some of my pantry essentials. Note that many have very long shelf lives so it’s easy to buy ahead and keep them around for a long time. Please share: what else would you make with these ingredients? 3 Responses to What’s in your Pantry? Your pantry/fridge ingredients sounds like mine! I have a great recipe for pantry red velvet cake or cupcakes! No eggs!